Hiding in plain sight. | Scuffalong: Genealogy. Hiding in plain sight. – Scuffalong: Genealogy. Almost exactly four years ago, with help from my late uncle Charles C. Allen and my new DNA cousin A.B., I identified Edward C. Harrison as the biological father of my great-grandfather John C. Allen Sr. The screenshot above shows a portion of the 1880 census of Harrison township, Charles City County, Virginia. Household number 73: Wm. L. Harrison, 32; his mother C.R., 64; and siblings J.C., 24, and E.C., 31. That’s Edward C. Harrison, his brother William Lambert Harrison, his mother Caroline R. Lambert Harrison, and his sister Jane Cary Harrison. (His father William Mortimer Harrison died in 1865.) Household number 74, right next door: Gram Allen, 26; wife Mary; and children Namie, 5, John, 3, and Emma, 1. That’s my great-grandfather John, his mother Mary Brown Allen, his adoptive father Graham Allen, and his half-sisters Namie (Naomi? Nannie?) and Emma. I repeat: living next door. Were the Allens tenants on the Harrisons’ farm? Graham Allen and Mary Brown married 22 June 1876, when she was just a few months pregnant by Edward Harrison. Were both of them already living on the farm? Why remain under the gaze (and, presumably, control) of the father of Mary’s oldest son? 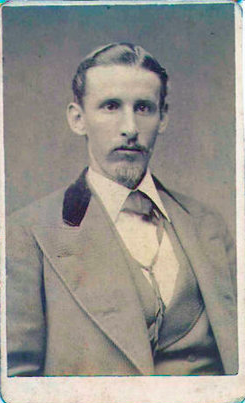 William Lambert Harrison (1845-1919), John C. Allen Sr.’s uncle. Amazing! Congratulations, on finding/confirming another part of your legacy.